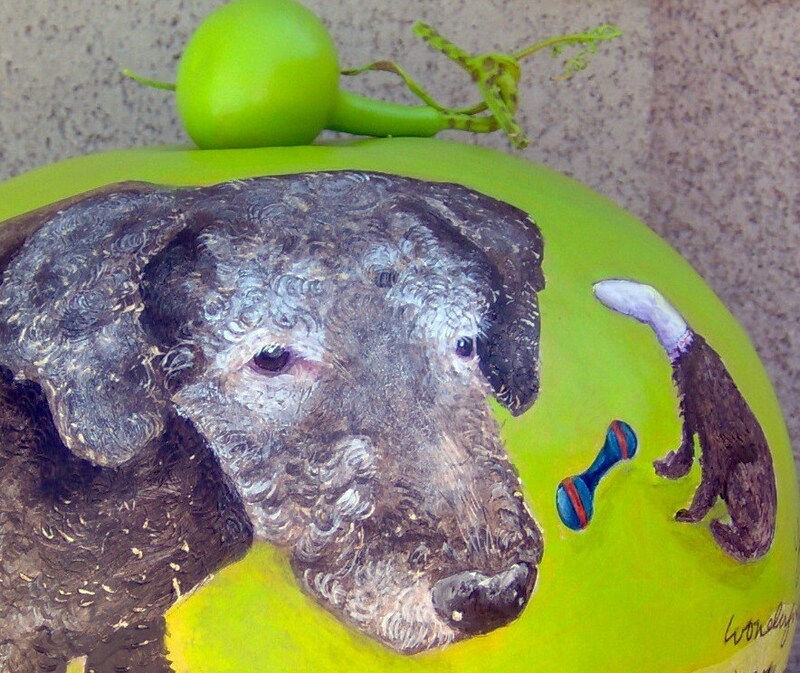 A Hungry Holler gourd urn serves as memorial art. 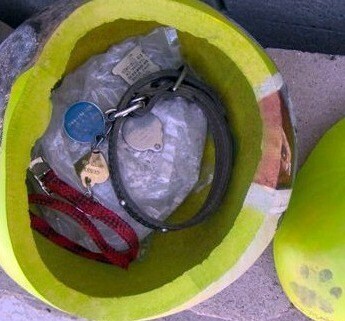 Your pet's image will be foremost. 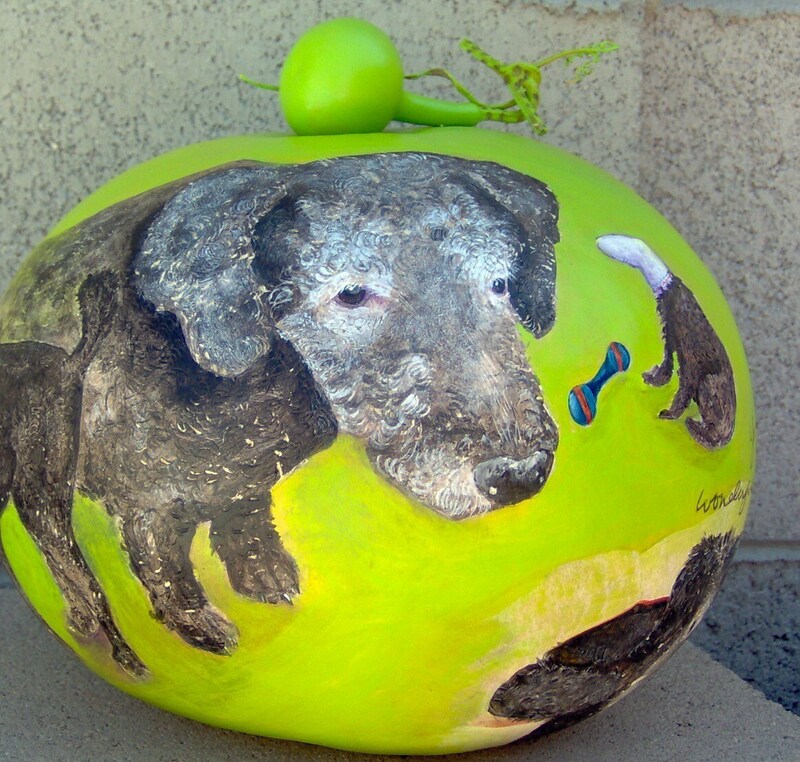 Tell me stories that make you laugh and make you smile and I'll interpret them and include them around the gourd. See that little image to right? Gus loved to play with socks. Every once in awhile he'd get one pulled over his head! Go figure. The words on the back are taken from the sympathy card sent by Gus' vet, reproduced faithfully in content and style. That's his paw print. My urns are important to me. We may speak on the phone, communicate via email. I will need photos. Tell me if your pet had an ear that didn't stand up straight. Tell me if your cat's tail was shorter than most. Details matter to me. Tell me colors you like and colors you can't abide. I will think about your pet and dream about your pet and together we'll create a functional piece of highly personal art. 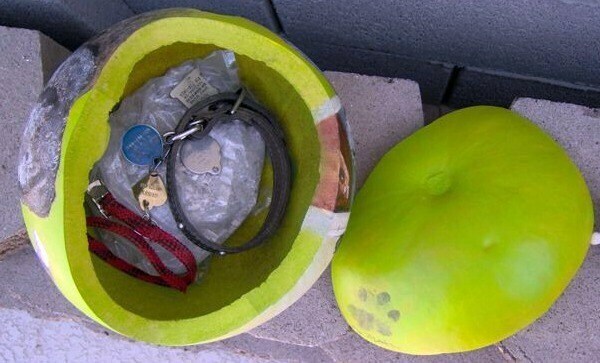 The chosen gourd will be sufficient to contain the cremains, a favorite toy, leash, collar. Usually four to six images of one animal are portrayed, sized to fit according to my aesthetic eye. It may be more. It may be less. They'll be sketched, then painted. 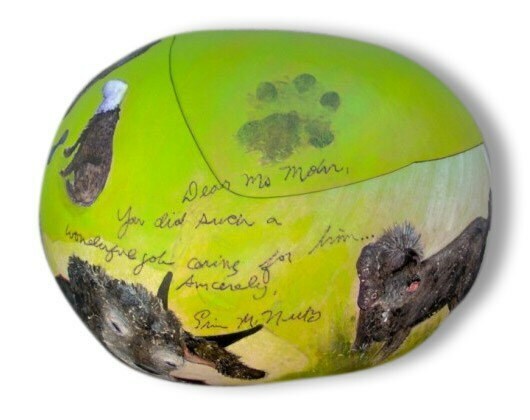 I also create memorial gourd urns in honor of beloved humans. The gourd will arrive in a recycled shipping box, nested in recycled packing material. A gourd sheet providing a brief overview of humankind's long relationship with gourds, and a hand-painted gift bag, and tissue (both made from post-consumer paper) included so you're good to go for gifting. Start to finish is usually about 30 days. Shipping NOT included. Shipping costs to be determined upon completion of the piece, and dependent upon gourd size, etc.